A knee walker is also known as a knee scooter which is used as a mobility aid to support those who have a weak or injures lower limb. The knee walker has a handlebar, basic frame, handlebar brakes, cushion, storage place, two front wheels and two wheels on the rear side. The padded cushion that is there in a knee walker mainly supports the knee and gives it rest. Those looking to buy a knee walker for themselves or for their close one should visit https://certhealth.com/collections/knee-walkers for the same. Why is knee walker prescribed by the health professionals? The knee walker is known to be useful for the recovery of patients who are dealing with foot and ankle injuries. It is also used in the treatment of diabetic plantar ulcers patients as an alternative to bed rest. Crutches are not known to be user friendly and are not ever helpful in moving smoothly; so the knee walker acts as an alternative to crutches. When using this there is also a limited use of the hands. It helps in saving the energy of the user as less energy is spent while using this device. The knee walker can be used on level as well as terrain surfaces. The knee walker frees the hand; as there is limited use of hand in this. One hand is only needed to steer the handbar. 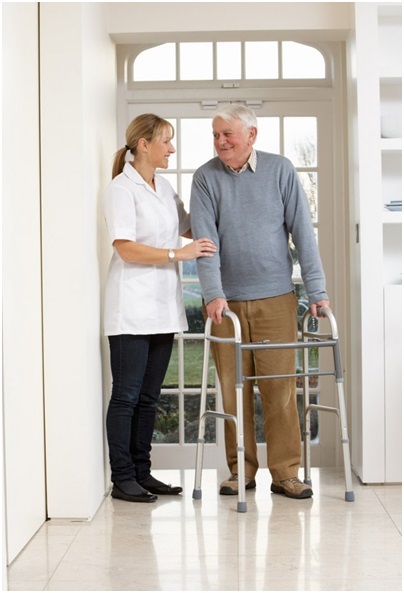 The work of walking is significantly reduced with the help of a knee walker. It safeguards the feet from getting injured because of accidental bumps as the feet are elevated in a knee walker. The body weight is equally distributed through both the legs. It helps in preserving bone strength and muscle bulk as the muscles near the injured leg are significantly used. How to select a knee walker? You should feel stable when you are stopping or resting with your knee resting on the pad. The knee pad should be supportive and also provide capability to adjust the height of the knee walker. The handlebars should also be adjustable in order to get the best possible fit and function. Test the handlebar brakes to make sure they are right and operate well. Do not forget to see the warranty period attached to it so that you know what exactly is covered in it. You can also read reviews before purchasing knee walkers online on https://certhealth.com/collections/knee-walkers so that you are sure about the model you are planning to buy. A knee walker definitely is a welcome change from crutches that are not easy to move around. They are known to make the arms and the wrist sore and there is also a chance of falling down or losing control. This is not the case with knee walker as one can easily maintain balance without having a fear of falling down.